Want skin bursting pumps without the addition of caffeine and other stimulants? ENFLATE is the answer, this non-stimulant formula is designed to improve blood flow and enhance pumps with the versatility to be taken with ENRAGE or used as a stand alone for those wanting to avoid stimulants. ENFLATE also includes powerful Nootropics to amplify focus and enhance cognitive function, taking the mind-muscle connection to the next level. *Mix 1 scoop with 6-8oz of cold water. Shake well and consume prior to training. Can be combined with ENRAGE and/or ENRAGE EXTREME for synergistic effects. Q: Can I stack ENFLATE with ENRAGE and/or ENRAGE EXTREME? A: Yes. ENFLATE stacks great with both ENRAGE and ENRAGE EXTREME to offer enhanced pumps and focus. The ENFLATE formula was designed to work synergistically with both ENRAGE and ENRAGE EXTREME. Q: Can I use ENFLATE on it’s own? A: Absolutely, ENFLATE is a very strong non-stimulant preworkout. 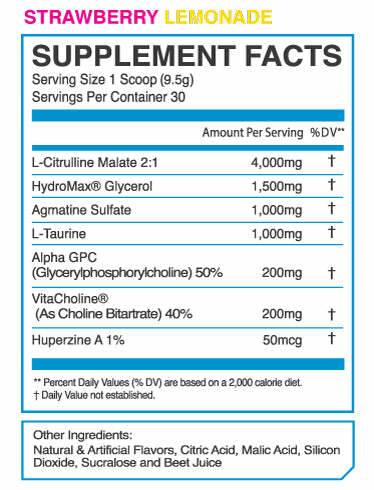 Great for individuals who want to avoid stimulants. A: With the addition of Focus compounds, known as Nootropics. ENFLATE improves cognitive function, and can enhance your mind-muscle connection. Q: What pump compounds does ENFALTE include? 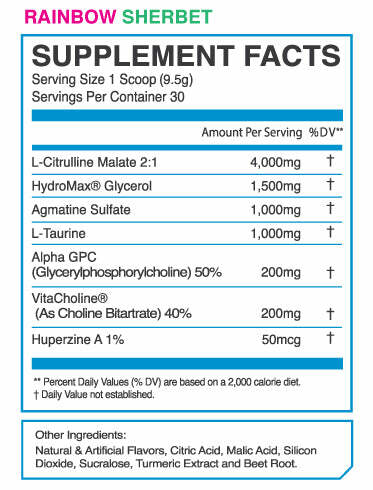 A: Citrulline Malate, HydroMax and Agmatine Sulfate. These compounds act as Nitric Oxide Amplifiers and increase vasodilation. Q: Will ENFLATE keep me awake at night? A: No, ENFLATE is a stimulant free product and is a great option for individuals who train late. A: Yes, ENFLATE is safe for both Men & Women. Q: Can I stack ENFLATE with ENCINERATE Thermogenic? A: Yes, these two supplements stack great together and offer synergistic effects. Q: Is there any sugar/calories in ENFLATE? A: No, ENFLATE contains zero calories and is sugar free. Q: Can I take ENFLATE on none-training days? 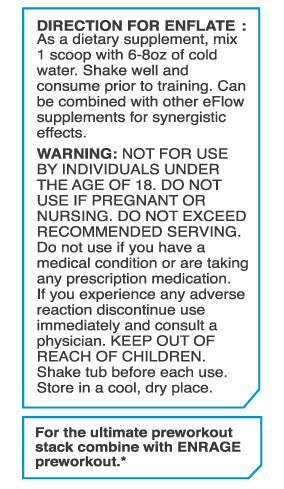 A: Yes, when you want some increase blood flow and improved focus take 1 scoop of ENFLATE at any time of the day. Q: Can I stack with ENDURE BCAA? A: Yes, for optimal results, take 1 scoop of ENFLATE with ENRAGE prior to training, and 1 scoop of ENDURE BCAA during training. Taste pretty dang good! It also gives some pretty solid pumps. Overall, great product and I would recommend to anyone. My fav eFlow supplement. Love the pump and focus. The Rainbow Sherbet flavor is great stacked with the enrage preworkout.